President Obama spoke of perception of Americans as "selfish and crass"
Travel expert urges visitors to be "respectful of the country and the culture"
(CNN) -- When travel author Beth Whitman was in Vietnam, she witnessed a group of young American male travelers rough-housing in the streets outside of the Rex Hotel. 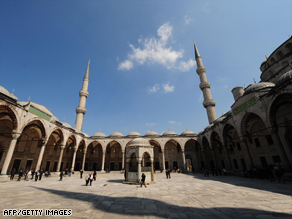 Americans traveling to sites around the world like the Blue Mosque in Istanbul should be respectful. In their youthful, loud exuberance, they ended up ripping each other's shirts as they horsed around. "I thought to myself that those shirts probably cost maybe 20, 30, 40 dollars apiece, and here you are in a culture where the people may not be even making that much on a monthly basis. "It's that sort of thing, just not being aware how off-putting that can be to the local culture." Such behavior, while seemingly harmless, can help to cement the moniker of "the ugly American," which came to refer to loud, rude and thoughtless behavior of U.S. citizens abroad. The term came about as a result of the book "The Ugly American," and more than 50 years after its publication, those from the United States continue to battle an image of arrogance and nationalism. Written by William J. Lederer and Eugene Burdick, the novel chronicled American foreign policy and diplomacy failures in a fictitious developing nation. In the book, the American ambassador to the country is portrayed as crude and inept. That enduring legacy has not been easy to shake, and even the U.S. president knows the score. During a recent trek to Turkey, President Obama said in his remarks at the Tophane Cultural Center in Istanbul that he knows the "stereotypes of the United States are out there." "Sometimes it suggests that America has become selfish and crass, or that we don't care about the world beyond us," he said. "And I'm here to tell you that that's not the country that I know and it's not the country that I love." Whitman, the author of the "Wanderlust and Lipstick" guides and publisher of "Traveling with Kids," often gives lectures and workshops -- many geared toward female travelers -- and speaks on the importance of Americans being stellar representatives of their homeland while abroad. There are some ways to not be considered an "ugly American'" when traveling. 1) Research the area and its culture before you travel to your destination. Read guidebooks to learn about the region. 2) Learn some basic words in the language of the region you are traveling to. Don't expect everyone to speak English. 3) Travel with a desire to experience the local cuisine. Don't expect to get a hamburger. 4) Don't flash around money or expensive items like cell phones and cameras. 5) Try to really experience the culture. You are less likely to offend if you understand. "It's about being respectful of the country and the culture, treating the people respectfully and not flashing around your money and your material possessions," Whitman said. "It's up to every individual to be that ambassador and portray their country well." Author Ann Hulbert wrote a piece for The New York Times Magazine a few years ago about her desire not to be mistaken for an ugly American when her family traveled to Istanbul and the Turkish coast. Hulbert took the step of vetoing one of her teenage son's T-shirts, worried that the message on it, "The Fighting Quakers. Beat them 'til they reach consensus," might be misunderstood in the Muslim country. Christopher P. Baker, who is a Cuba travel expert and award-winning author of the best-selling guidebook "Moon Cuba," said he has concerns about what will happen if and when travel restrictions are completely lifted from that country. He recalled two years ago when he was reviewing one of Havana's first five-star hotels that had just opened. Standing in the lobby with one of the hotel's executives, he witnessed a man, dripping wet from the pool and wrapped in a towel, emerge from the elevator. The man walked through the bar, down the stairs and into the marble lobby just as the staff tried to intercept him, Baker said. "I heard them say, 'We don't allow guests in the lobby dressed this way,' and the man said, 'Yeah, I know' in this deep American brogue," Baker said. "Behavior like that is not necessarily common to Americans, but it's the type of thing that can give Americans a bad name." Manners and lifestyle expert Thomas P. Farley runs the site What Manners Most and said Americans tend to be seen as free-spirited and not nearly as guarded as natives of some of the other countries -- as evidenced most recently by first lady Michelle Obama putting her arm around Britain's Queen Elizabeth II. "That's something that maybe sent shivers up the spine of a lot Britons, but in the final analysis, people really looked at that as a nice gesture and something very American to do," said Farley, who added that travelers should be as respectful in other countries as they would be if they were in someone else's home. The Obamas may actually be aiding in changing the perception themselves. Travel writer Beth Whitman said the mere election of President Obama has helped to improve America's reputation worldwide. "It helped to change how we are viewed, but the real key is the behavior once a person arrives in a country," Whitman said. "Some of [the ugly American perception] will exist no matter who is in office, and that's why everyone has to take responsibility for being the very best representative of their country that they can."